New Blackhawk AK47 8-magazine chest pouch in coyote tan. Crossed back strap with full range of adjustment for a quality fit. Holds 8 AK47 magazines and two pistol magazines. 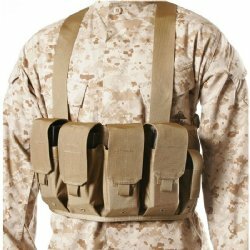 In total there are 4 rifle mag pouches (each holds two magazines) and two pistol pouches (each holds one pistol magazine). Works with the vast majority of AK47, AKM and AK74 30rd magazines including all military issue mags we have tried.